Appearing on the periodic table of elements at number 22 is the metal titanium. Discovered in 1791 by the Reverend Walter Gregor, it's name came from Martin Heinrich Klaproth who chose it from the Titan's of Greek mythology. Titanium is truly an amazing metal that is used in airplanes , aerospace & military technology, bodily implants as well as special medical tools and of course the bicycle world. My first introduction to titanium in the realm of bicycles goes back to the early 70's. In 1973 two companies almost simultaneously came out with frames made of titanium. One from the USA, the Teledyne Titan and one from the UK, the Speedwell Titalite, from the Speedwell Gear Case Company in Birmingham. At the time I happened to be working at a bike shop who had hired a fellow from England who did the initial testing on the Speedwell titanium frames. That season Luis Ocana rode several stages of the Tour de France on a Speedwell titanium frame. This was the very beginning of titanium in the pro peloton. A number of years passed before other frame builders began to exploit the amazing properties of titanium in racing frames. Today we see many titanium frame makers. The hottest new bike is definitely the "all road" or gravel bike and many of the best ones are made from titanium, exploiting the magic carpet ride that only Ti can provide. Luis Ocana with his Speedwell titanium machine. Frames are not the only place where titanium shows up. Numerous components are made from this metal. I'd like to highlight the area's where titanium crops up in the world of wheels. Hub makers have for some time used titanium successfully in several areas. Titanium axles have been used by Shimano in some of their Dura Ace hubs. They are lighter than steel yet super strong. Shimano has also used titanium for their Dura Ace freehubs. In my opinion there is no better material for a freehub. Hadley hubs from California offers a Ti freehub. Titanium has an ideal strength to weight ratio and will not rust or corrode and therefore surpasses in this area. A Shimano Dura Ace titanium freehub. Lightweight titanium quick release skewers. Some of my favourite hub manufacturers have chosen titanium as their material of choice for not only for their freehubs, but several other parts as well. 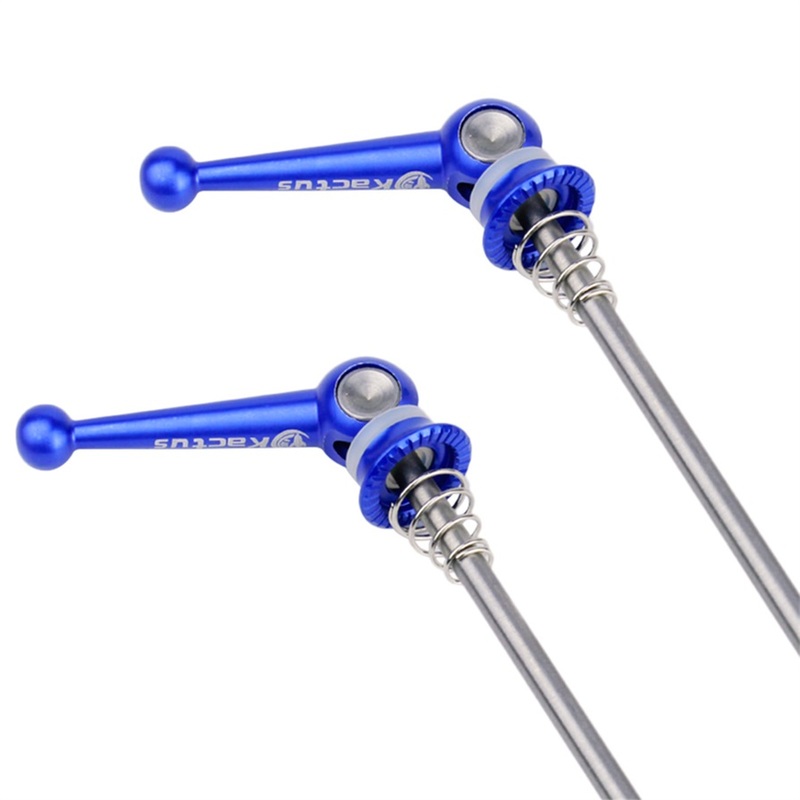 Titanium 6AI-4V quick release skewers are very popular and are both extremely strong and reliable. Companies like Royce in the UK and Gokiso in Japan have made hub models from solid titanium billets. These hubs are quite expensive but they are incredible and unique. Gokiso titanium hubs from Japan. Made from solid billets of aero space grade Ti. Undoubtedly the most expensive hubs on the planet. Royce titanium hubs with a carbon fibre centre. Spoke manufacturers have not ignored titanium but their success's have remained somewhat elusive. DT Swiss once made a titanium spoke which is now discontinued. Today companies like Pillar of Taiwan are producing 3 titanium models at very light weights. These spokes are best left to very light riders who are looking to keep their wheel weights at an absolute minimum. Pillar's X-TRA Lite Ti bladed spoke. A 260mm spoke weighs an incredible 2.6 gr grams!